If it weren’t such a cliché, we’d say Lake Louise is like a postcard you can step right into. OK, we'll say it anyway. In winter, the frozen lake is packed with Canadians ice skating in their natural habitat. The hamlet of Lake Louise has provisions for whatever your adventure. ● Viewpoint: In summer, hike to the famous tea house, about a two-hour trip upwards. Lake Louise will look like a big turquoise cocktail. Expect to get approximately one billion photo ops and a fierce appetite en route. ● Sleep tight: Go full-mountain by staying in a nearby historic lodge and eating local game meats and seasonal Alberta vegetables paired with Canadian wines. 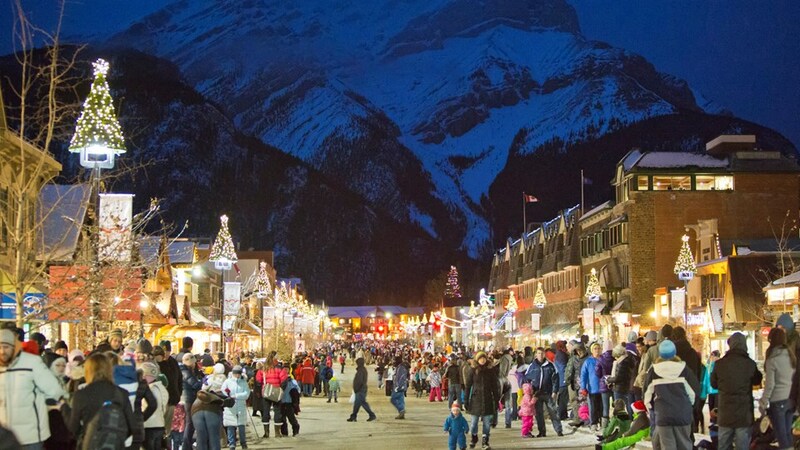 Canmore and Banff embrace winter with festivals, parties, celebrations and winter wonderland adventures. Canadian Rockies lodges are the perfect retreat for any year round wilderness adventure. Located in the heart of the magnificent Canadian Rockies, the Lake Louise Ski Resort has a legendary 4,200 skiable acres of world-class terrain, and famous friendly hospitality, that speaks for itself. The unique layout with beginner, intermediate and expert runs from every chair allows families and groups of varying abilities to share the experience together. There are endless chutes, glades and gullies, gentle slopes, cruising runs, remote bowls and some of the most challenging terrain in the Rockies. Renowned dining options included a sushi restaurant a gourmet meals. Non-ski activities include the Winter Sightseeing Gondola, snowshoeing, snow tubing, and events. Ascend to one of Banff National Park’s most incredible views where grizzly bears and other local wildlife are seen almost daily. From the top, at 2,088m (6,850ft) the gondola ride is only the start of your adventure. Make your way to the viewing platform for a panoramic view that will take your breath away. Afterward visit the free Wildlife Interpretive Centre where Interpretive Programs are offered daily, including indoor presentations. A variety of guided interpretive walks are available daily for all fitness levels. There are five unique restaurants located on-site that are sure to please. Chateau Mountain Sports is an independent retail store. Open 7 days a week, this location offers clothing, footwear and accessories you'll need for hiking and skiing. Featuring great brands such as Arc'teryx, Canada Goose, Spyder, Patagonia, The North Face, Black Diamond, Dale of Norway, Dakine, Salomon, Merrell, Oakley, Sorel, Buff and more. Num-Ti-Jah Lodge is an intimate 16 room lodge located on the shores of Bow Lake. The simple but comfortable rooms overlook one of the most beautiful settings in the Canadian Rockies. The Elkhorn dining room serves hearty and fresh Canadian fare. Deer Lodge - with much of its original hand-hewn log structure and decor still in place - is the classic definition of rustic mountain accommodation. Located just minutes by foot from the enchanting Lake Louise, this century old property has seen substantial restoration of its early architecture. The Canadian Rocky Mountain Resorts lodge is ideal for guests looking for a quiet retreat with dazzling views, delicious cuisine and attentive staff. Think intimate rooms with inviting feather comforters and historic furniture. Skoki Lodge is a National Historic Site situated in a beautiful high alpine region in Banff National Park. 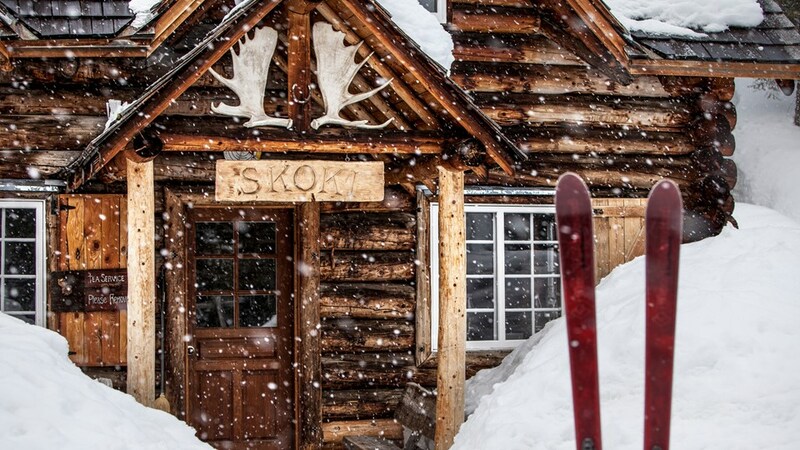 The 11 km (6.8 mi) trek from Lake Louise to the Skoki Valley makes Skoki Lodge an ideal destination for hikers and skiers of all levels. Rolling foothills, intimidating mountains, pre-historic hoodoos, emerald lakes and fascinating arts, Alberta is home to a changing landscape and an array of activities. Visitors will explore diverse scenery on this 11-night tour, from the majestic mountains of the Canadian Rockies to the prairie lands and coulee landscapes of the Badlands. The Winter Weekday Special is valid Sundays-Thursdays only. The package includes an overnight stay at Canalta lodge, 2 one-day tri-area lift tickets, freakfast, underground parking, hot tub, sauna, outdoor pool. All prices based on double occupancy. Taxes extra. Price subject to change based on hotel occupancy. During this retreat, Sarah Harvie combines yoga & meditation with time in this powerful wilderness setting to allow you to unwind, dive deep into your practice and reset your nervous system. The retreat includes four long yoga practices. There will also be walking meditation in nature beside the Bow River. Experience the silent grace and beauty of travel by dog team in the jewel of the Canadian Rockies. Kingmik Dog Sled Tours is the only company offering tours in Banff National Park, in Lake Louise. If you are staying in Banff, transportation from your hotel in Banff is provided. You'll be back to Banff in time for dinner. A variety of tours are offered, ranging from 16 km in distance (1.5 hours) to 5 km (1/2 hour). On average, 5 sleds are run per tour. All sleds are guided by experienced dog mushers and guides who can share with you their adventure stories. All dogs are cherished family members. Their care is the top priority. Feel the exhilaration of the Kicking Horse River while being surrounded by the majestic Rocky Mountains. Kids, both young and old, love the fun waves and exciting rapids, dad's enjoy the paddling and mum's appreciate our great facilities and gear. Everyone loves the area's best river. An all-round great family or group adventure.With four distinctly different trips daily, from mid-May to mid-September, we have the perfect trip to suit your adventure level and recreation schedule. Door to door shuttle available from Lake Louise.Great package option: Combine rafting with the Lake Louise Sightseeing lift. Timberline Tours offers trail rides, day trips and overnight horseback riding adventures in the breathtaking Canadian Rockies. Whether you choose a scenic ride in Lake Louise, a three-hour ride to the historic Lake Agnes Teahouse or venture further to explore the Plain of Six Glaciers and beyond, you'll enjoy spectacular mountain views and expert instruction. Spring skiing and riding is in full swing here at the Lake Louise Ski Resort! Soft turns, sunny skies & après in the Base Area make for a fun filled weekend in the Rockies. They are going to add a little bit of something special to every weekend in April, by hosting some exciting & diverse bands who will be playing free, live music on the Coca-Cola Stage for guests to enjoy. Happening every weekend from April 6th to May 5th. Watch the fastest skiers in the world begin the World Cup speed circuit at the Lake Louise Ski Resort. The best skiers converge on Lake Louise, where you can see them cross the finish line for free. Experience the ultimate spring apres ski event in Canada. From 11:00am - 6:00pm, come to the Lake Louise Ski Resort base area and enjoy free live tunes at the Kokanee Kabin by Buffalochild, Burchill & Troo Knot while sipping on glacier fresh beer. Pond skimming for all ages across the pond in the base area. Other fun games for all ages to enjoy. At night, return to the Lodge of Ten Peaks for a concert you won't want to miss! For $25 entry, see The Dudes with The Pistolwhips rock the lodge at 8:30pm. Free shuttles to and from Banff and Lake Louise are provided in your ticket and you can purchase a 20% off lift ticket for the day as well. Let's celebrate an incredible winter ski season, at the Lake Louise Ski Resort!